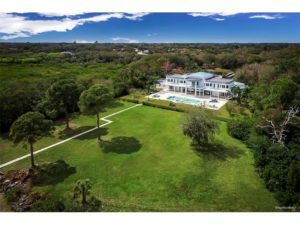 This 9,0000-square-foot home, located on 10 acres off Philippe Parkway in Safety Harbor, reportedly sold for $6.875 million in October 2016. Credit: MFRMLS. Back in October, we reported on the sale of a 9,000-sq.ft. mansion along the Safety Harbor waterfront that sold for $6.9 million, making it the most expensive home in Pinellas County. At the time, speculation was rampant as to who purchased the Philippe Parkway property, which sits on 10 acres of land and features six bedrooms, six and a half bathrooms, a four car garage and a 300-foot dock that juts out into Old Tampa Bay. John Travolta was spotted in the area with his family at the time of the sale, leading some to believe the legendary actor, and noted Scientologist, bought the home from the prior owners, Kung-Ti and Wen-Ying Sung Yen, who paid $750,000 for the lot in 1998 and built the home in 2002. This rumor has since been dissolved in a recent article by the Tampa Bay Times, who identified the new owners. The recent article by the Tampa Bay Times listing the 25 priciest homes in the Tampa Bay area based on 2016 records, referenced the new owners of the Safety Harbor manse, which was number two on the list… (*update, the Tampa Bay Times have since removed the owners information from their article since the time the original article was run). According to the Times piece, the sale of the Safety Harbor home was the most paid for a single-family bay area home since 2013. This 9,0000-square-foot home in Safety Harbor that sold for $6.875 million in October 2016. Credit: MFRMLS.